In appreciation of all my loyal readers and in the spirit of the holidays, I have decided to do a 12-day giveaway in these here Trenches. One new item each day. Perfect for re-gifting as Christmas gifts (I'll try not to be offended), or keeping for yourself! You must be a blogger to enter these giveaways, and you need to leave a comment on each daily giveaway you wish to be entered. The 12 winners (one per day per giveaway) will be drawn on December 13. A partridge in a pear tree. A Braun thermoscan for my baby. With a pre-warmed tip (for improved measuring conditions and accuracy) and a built-in guidance system, this ear thermometer from Braun gives you a more accurate reading than a rectal (ewww) or temple reading. Please leave a comment below if you wish to be entered in this giveaway! I would love to win this with the cold season and new baby coming! Our other one is not nearly as fancy! Don't enter me in this. I just wanted to say I love your idea of giving away gifts for 12 days. How cool is that? Okay, would so totally LOVE this with three kids under 5 in the house. Do we get to enter for each one? So cool of you to have a Christmas giveaway! I'd love to have this, I'm still using the one that the hospital sends home with you when the baby is born! Not very high tech! I'd LUVE a good thermometer. I only have a cheap under the arm digital. I question its accuracy every time. Happy Holidays! Is it inappropriate to still be using a rectal thermometer on a 4 & 3 yr old? Just kidding. Seriously... we need a new thermo. and you must be reading my mind! New baby in March! Pick me! Pick me! is it bad that i could never do the rectal?? seriously. just couldn't do it. OH I have FIVE kids and at the moment 2 amd MOM have strep so I could really use one of these. Besides I don't think that Mom's cheek test is really al that acurate way to tell if your kids mave a tempature. Ooh me please! My kids just broke my 2nd ear thermometer. Sigh. Thanks! Me please and thank you! I would love to win this one. I have yet to find a thermometer that actually works. Ah, yes. Please. Anything to help nurse mommy at sick bay. Thanks! Oh, we TOTALLY need a new one! The kids have played with the old one (popping the plastic thingy off one too many times I think) that it is a bit temper-mental....I promise I won't let them anywhere near this one unless they are really sick! I really need one of these. I would lOVE to win it. Please enter me, thanks! This sounds way better than an armpit thermometer. I registered for this but didnt get it. Oh please! I'm constantly having to temp my son as we've had months of sickness and the rectal temps are near impossible! we would love this! I have a dear friend that could really use this! I would love to try this out my kids. 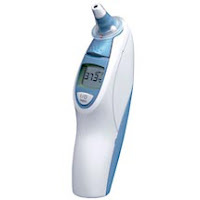 Our ear thermometer bit the dust about 6 months ago...this would be AWESOME with cold and flu season here!